Mycrocrystalline Hydroxyapatite (MCHA) is a natural compound that makes up the crystalline matrix of bone and teeth, and is the substance that gives them their rigidity. MCHA is a source of highly absorbable Calcium and Phosphorus, which are the major mineral components of bone. 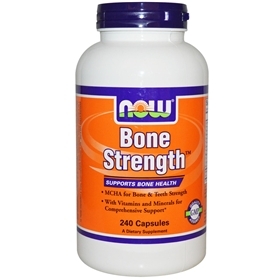 NOW Bone Strength is a comprehensive bone support product providing 4 g (4,000 mg) of MCHA. It also contains Magnesium and Trace Minerals, as well as Vitamins C, D and K to aid in the synthesis and maintenance of bone tissue. Calcium is the chief supportive element in bones and teeth. Calcium salts make up about 70 percent of bone by weight and give your bone its strength and rigidity. Almost all of the calcium in the human body is held in the bones and teeth. The remaining 1 percent of calcium circulates in the bloodstream, where it performs a variety of important functions. It helps to contract muscles and helps regulate the contractions of the heart. It plays a role in the transmission of nerve impulses and in blood clotting. Calcium is involved in the stimulation of contractions of the uterus during childbirth and in milk production. It also regulates the secretion of various hormones and aids in the functioning of various enzymes within the body. Since vitamin C is important for so many necessary bodily functions, taking a liquid mulitvitamin that is rich in vitamin C is advised. When we take Calcium, it absorbed in the small intestine and passes from there either into the bloodstream or ultimately into the bones. The most efficient absorption of calcium is dependent on the presence of vitamin D in the body, which is a key ingredient in the various hormones that enable calcium to pass from the digestive system into the blood or bones. Similarly, there are optimal ratios of phosphorus to the amount of calcium consumed that permit calcium to be more completely utilized. Hormonal secretions of the parathyroid and thyroid glands (parathyroid hormone and calcitonin, respectively) also help maintain calcium equilibrium in the blood. These regulatory mechanisms help to prevent a deficiency in calcium from developing in the bloodstream. When such a deficiency does develop, parathyroid hormone acts to transfer calcium from the bones in order to maintain the mineral's all-important presence in the bloodstream. This of course strips your bones of their calcium and in turn weakens your bones, making them more brittle and subject to breaking. The result of a mild insufficiency of calcium over the long term may be thinning bones, termed osteoporosis or the softening of bony tissue, called osteomalacia. The faulty metabolism of calcium during childhood may result in a condition called rickets. Suggested Usage: As a dietary supplement, take 6 capsules daily, in 1-3 divided doses, preferably with meals. Other Ingredients: Cellulose, Gelatin (capsule), Stearic Acid (vegetable source), Magnesium Stearate (vegetable source) and Silica. Contains shellfish (crab, shrimp, lobster, crayfish) derivative. Contains no: sugar, salt, starch, yeast, wheat, gluten, soy, milk, egg or preservatives. NOW Arnica Soothe Massage Gel - 2 oz.